Able Storage is a market leader in supplying a complete range of cantilever racking systems for easy access to bulky goods. 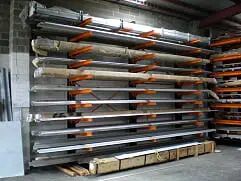 We also provide an extensive range of cantilever racking systems for sale as a complementary to our pallet racking solutions. If you want to have quick and direct access to awkward, long, and odd-shaped goods, then our cantilever racking is an appropriate option for you. It is a perfect solution for the extra-long goods or items that cannot be palletised. It consists of modular components that give an economical solution for the storage of long items. Its arms are adjustable as per your storage requirements of odd-sized products. It can be galvanised for the outdoor use. It is a self-supporting system and does not need to be hung on the building wall for stability. Cantilever arms are supplied with a number of accessories, such as steel plank stops, end stops, spool holders, etc. We offer ground guidance rails to prevent any kind of racking damage. Lightweight and flexible in design. Suitable for every type of material, such metal, cloth, plastic, etc. 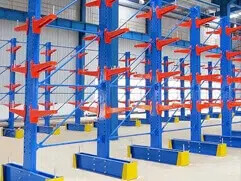 We provide both single-sided and double-sided cantilever racking as per your storage requirements. The single-sided option provides an ideal solution for placement along the wall whereas double-sided cantilevers can be used along the aisles of the warehouse. 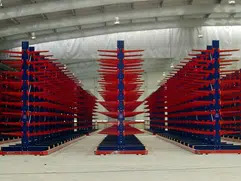 Call Today To Place An Order For A Quality Cantilever Racking! For more information and queries on our cantilever racking products and services, feel free to contact Able Storage on (03) 9305 3676.